If Dashlane is working in one browser, but does not seem to work at all in Firefox, or if Dashlane stopped working completely, you may need to check your extensions to make sure Dashlane is properly installed. In order for Dashlane to operate, you should see a shield icon in your Firefox toolbar, and it should be outlined in the color teal when you are signed in to your Dashlane account. If Dashlane's icon is grayed-out, spinning or if there's no icon at all, see the instructions below on how to reinstall your extension, which will usually solve the problem. If the Dashlane extension is already active, please try to close and reopen Firefox, or to disable and reactivate the extension. 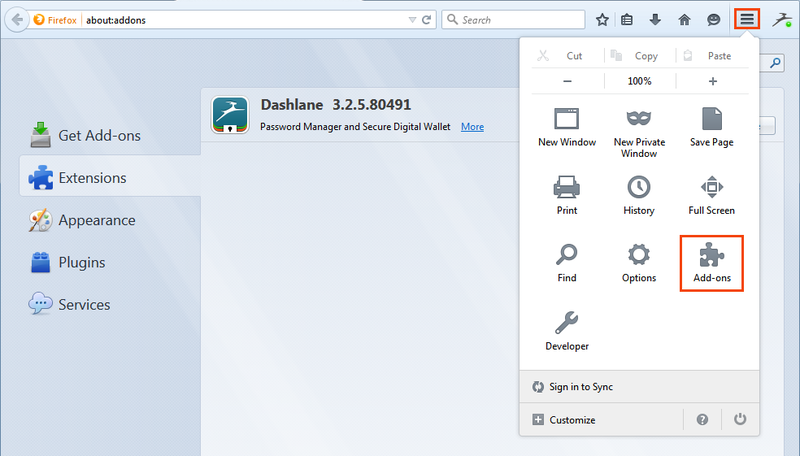 If it still does not work, or if the extension is simply missing from the toolbar, here is how to re-install the Dashlane extension in Firefox. Choose Uninstall Firefox extension (if you are prompted to Install Firefox extension instead, install it and you are done here). 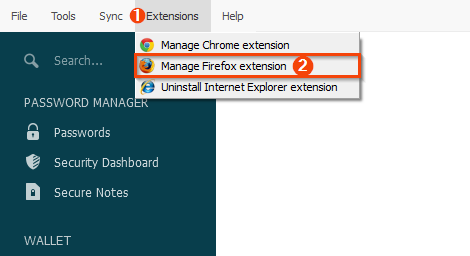 Go back to the Extensions menu, and choose to Install Firefox extension this time. 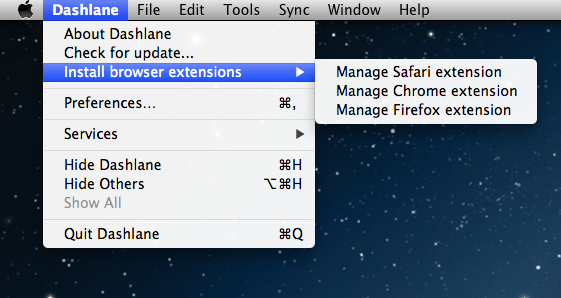 Make sure that you click OK to confirm you want to install and enable the Dashlane browser extension. Otherwise, Dashlane will be installed but disabled in Firefox and it will not work. Select Manage Firefox extension. This will let you uninstall the extension in Firefox. 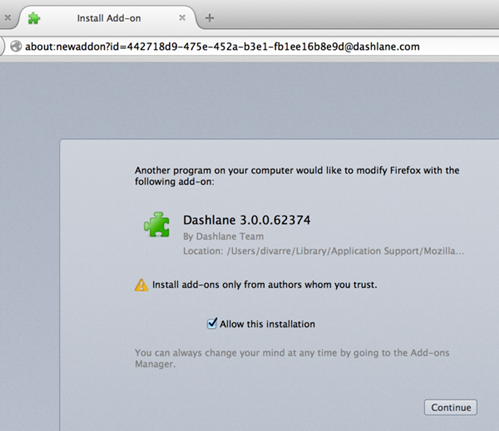 It will open up Firefox with instructions to remove Dashlane from Firefox. Please follow these instructions: Go to Tools → Add-ons → Extensions and remove the Dashlane extension from there. Please note that if, at this point, you're prompted to install the extension in Firefox instead of uninstalling it, you should proceed to installing the extension directly, and you may then skip the following last paragraph. 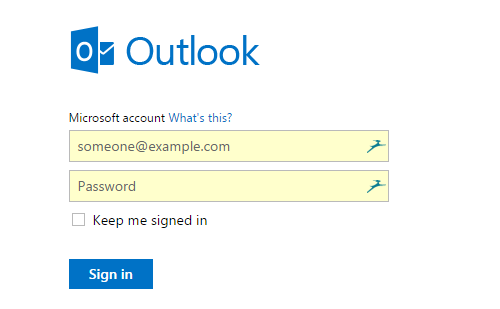 After that, please go back to the application and click on Dashlane, then on Manage Firefox Extension, and follow the instructions to install the extension this time. We advise you not to uninstall the extension on Linux and Chromebook except on recommendation of the support team. These impalas will be blue if you already have a Microsoft account, or gray if you do not have one. For more about impala colors, please refer to this guide. 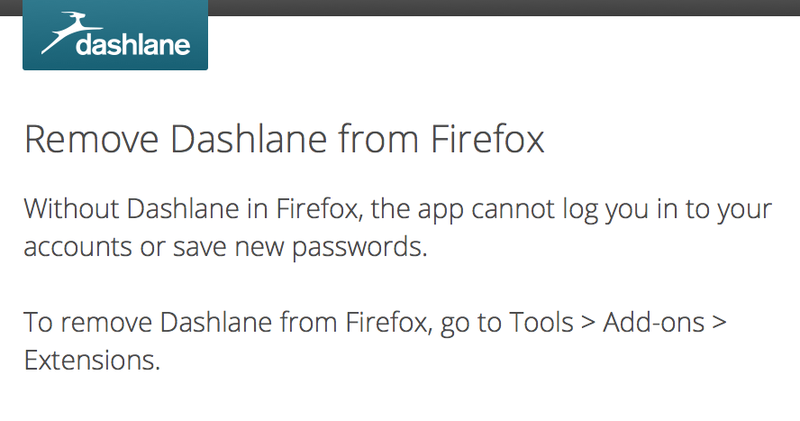 If Firefox says that Dashlane is incompatible but you're using the latest public release of Firefox, don't worry. You just have to upgrade Dashlane! You just have to upgrade Dashlane and it should be working. To upgrade Dashlane, open Dashlane and select Tools → Check for Updates. Update on Mac OS X by checking for updates in the Mac App Store or by opening Dashlane and selecting Dashlane → Check for updates in the top bar menu. 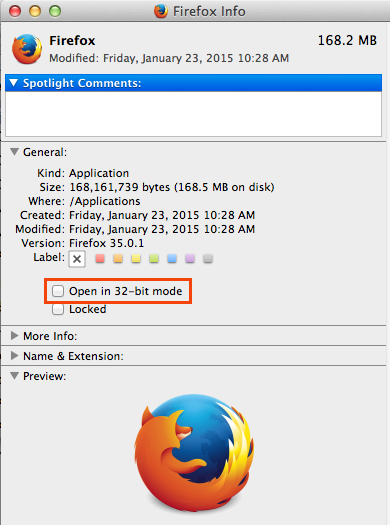 If the Dashlane icon is grayed out in Firefox, this may be that your browser is set to open in 32-bit mode. 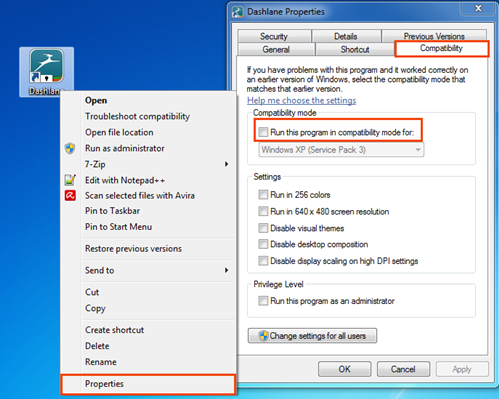 The 32-bit mode is unfortunately not supported by Dashlane and Firefox must run in 64-bit mode in order to work with Dashlane.